The Marvel Family Web :: Fun Facts :: Fun Fact #8: Captain Marvel had his Name, Now it was Time to Name his Book! Captain Marvel had his Name, Now it was Time to Name his Book! Struggling to come up with a title for Captain Marvel's new book, the Fawcett staff took some more inspiration from their founder. Captain Marvel's alter ego, Billy Batson, had been named in honor of Fawcett publisher, Wilford "Billy" Fawcett and Captain Marvel had received his miltary rank from Fawcett's own rank during World War I. Even Cap's insignia was borrowed from the logo of Fawcett's first magazine, Captain Billy's Whiz Bang. Borrowing one more piece of lore from the their founder and his first magazine, the Fawcett staff settled on a name for the book — Whiz Comics. Now that Fawcett's flagship character had a name that met with resounding approval, the Fawcett staff quickly came up with a name for its flagship title. Whiz Comics! 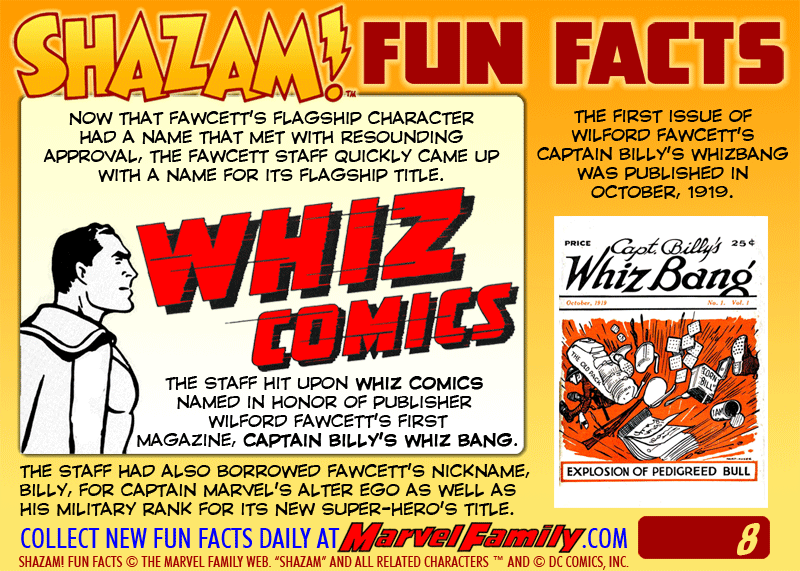 The staff hit upon Whiz Comics named in honor of publisher Wilford Fawcett's first magazine, Captain Billy's Whiz Bang. The staff had also borrowed Fawcett's nickname, Billy, for Captain Marvel's alter ego as well as his military rank for its new super-hero's title. The first issue of Wilford Fawcett's Captain Billy's Whiz Bang was published in October 1919.